What a book. Consider my mind blown. To describe the objects of the future, Sterling created the neologism “SPIME“. Spimes are objects that can be tracked and analysed throughout their lifespan, from virtual beginnings, through a physical object and back again. In a world of spimes, objects are “material instantiations of an immaterial system” – once their period of usefulness is over, they are disassembled and ready to become something else. They are objects linked into a vast network, contributing to and reacting to data as protagonists of an ongoing process. There are too many exciting things about this for me to fit into one blog post. But one thing I think could be truly revolutionary would be this. Sterling says that “with enough informational power, the invisible hand becomes visible.” He is referring to Adam Smith’s “invisible hand of the market” – the theory that a lassez-fair approach to markets will allow them to regulate and run themselves. With spimes, we can track an object from its manufacture to the end of its life. We know how its made, what materials its made of, where it has been, what it has been used for etc etc etc. A spime world lays bare the entire industrial process as we know it, and in doing so, exposes its corruption, wastefulness and exploitation. Imagine the potential of this. Will we be so willing to buy that £2 Primark T Shirt when we can see more clearly the squalid conditions in which it was made? Futures of objects can be mapped too – we can see how long it will last, how it will be discarded, what environmental impact that has etc. It will make the whole lifespan of an artefact transparent, and make us question why we buy things (and how we use things) much more deeply. The crucial thing, too, is that it is a future that actually has a future. The current industrial capitalist system is not sustainable. Its said that we would need three or four planets to continue sustaining life as we know it for long, and even then they would eventually perish. A spime begins as a virtual, potential object on a screen and is at some point fabricated to perform its task. It is designed in such a way that it is just as easy to de-fabricate, re-evaluate and make into something new. It would be a culture where objects finally reflect the transient existence of their users. I will probably be getting on a bit by the time a vision such as this even comes close to becoming true. But I’m bloody fascinated to see what happens between now and then. 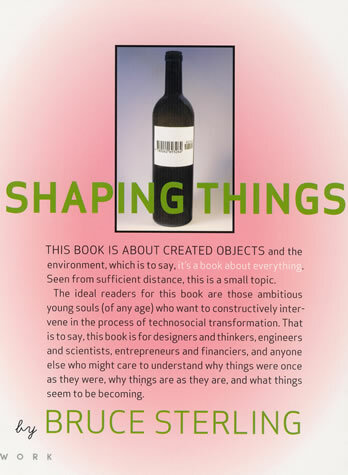 This entry was posted in Readings and tagged bruce sterling, futurology, internet of things, shaping things, spimes. Bookmark the permalink.